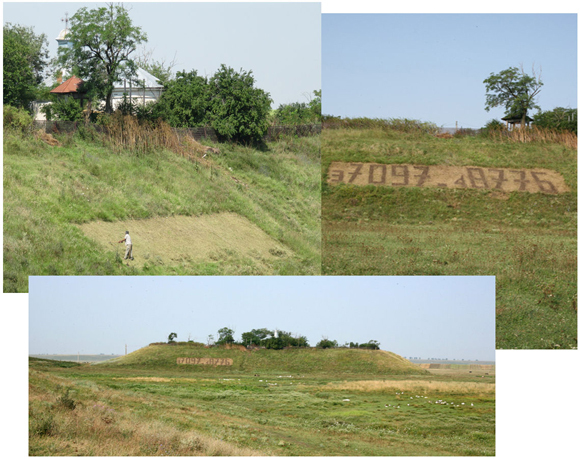 Michaël Jasmin’s cutting the shapes of numbers into the turf of the land around the settlement tell (in order to inscribe the UTM coordinates of the site) was an attempt to transform the existing and canonical archaeological and culture historical naming of the site (e.g., as Măgura, as Late Neolithic, as settlement, as cultural monument, as record of early complex sedentism). As Jasmin’s work progressed, it became a topic of debate among villages: did the inscribed numbers refer to biblical phrase; was it the mayor’s phone number; was it a political campaign slogan? As an unintended consequence, Jasmin’s cutting brought into open discussion an archaeological site which had been deeply sedimented into the background noise of villagers’ everyday lives. Michaël also explored the concept of the archaeological grid through photography within the village and through experimental writing, narrative and drawing. He produced a book about his work: The brain of the archaeologist: an art & archaeology dialogue. Michaël's art residency took place in Măgura in July 2010 and some of the outputs produced contributed to the Măgura Trecut şi Prezent expoziţie at the Muzeul Judeţean Teleorman.